One day, Charlie decides to wear the bright red purse his grandma gave him. 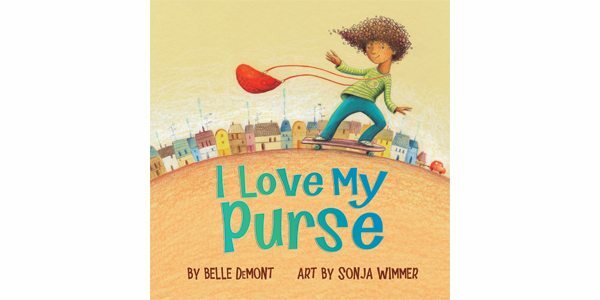 When Dad objects that boys don’t wear purses, Charlie says, “But I love my purse!” At school, his friends also ask why he’s wearing it, and he responds, “’Cause I want to.” They all note that there are many things they’d love to do but can’t, yet Charlie remains calm and firm. The crossing guard is the one exception: he admires the purse and mentions his own beloved but unworn sparkly shoes. Before long, Charlie’s attitude begins to affect his world: Dad ditches his tie and wears his Hawaiian shirt to work; Charlotte paints her face like a tiger; Sam cooks his favourite meal in the school kitchen; and the crossing guard wears his shimmering blue shoes. By the end, everyone is willing to try something different. With his polite determination not to conform to other people’s gender expectations, Charlie is the heart of this delightful story. The message emerges naturally through Charlie’s interactions with the quirky characters who populate his world. The repeated phrase “hold on, wait a second” initially signals a question about Charlie’s purse, but by the end is spoken by Charlie himself when he notices the changes in others. He is never bullied – instead, the prevailing mood is good-natured curiosity. The warm relationship between Charlie and his dad, who seems to be a single parent, is beautifully drawn. Sonja Wimmer’s colourful illustrations capture the energy and whimsy of the story and the characters. Just as the text is knit together by verbal repetition, the red purse is a unifying image appearing in every frame, at one point opening up to reveal a whole imagined world inside it complete with a dragon, a toad, and a small creature flying an airplane. Wimmer’s rich pictures vividly bring the story to life.